Boss LTR has a unique position as both a UL certified manufacturer of Boss rental lighting products,as well as, being their exclusive rental provider. UL Standards development covers more than just products; it also includes testing of systems and services. Boss is widely known for our work with safety standards and UL certifications, UL develops a wide variety of standards to measure and validate performance, environmental health and sustainability. Boss re-validates all their products back to original OEM Safety Standards after each rental return. You can have peace of mind knowing your safe. Why is it important to have lighting supplier that's approved by the Underwriter's Laboratories? This is the highest recognition for 3rd party safety validation that can be achieved in the industry. You can rest assure that the lighting products you rent from Boss have gone through rigorous testing and performance evaluations from the Underwriters Labortories. This validation gives you the peace of mind knowing that your staff will remain safe when using our lights in division rated areas. How do check and see if my current lighting supplier is UL certified? 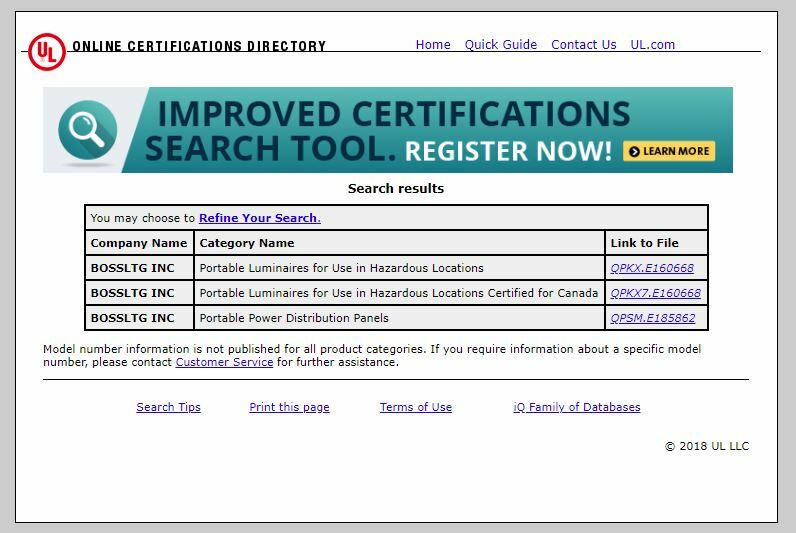 It’s very simple to complete a UL search on a company. Just visit their website and search for their company name. Verify ours by searching for the company BossLTG. In the event of a safety incident related to explosion-proof lighting, who is held responsible? The industrial owner, general contractor, trade contractor, rental dealer, supplier, and manufacturer. The US Department of Labor has ruled that ignorance is no excuse for non-compliant of OSHA standards. Knowing OSHA safety compliant standards is an expected part of the due-diligence process of being project responsible. How often are the lights I rent from Boss re-validated to meet UL certification standards? Boss revalidates all of our lighting products between each rental. If asked for, we’ll provide you with a certificate of compliance validation form pictured above. This re-validation gives you the peace of mind knowing that we’re not just repairing the lights to get them out the door for the next rental. We’re ensuring they meet the highest level of safety validation through our proven experience UL certifications. Why is re-validating my portable and explosion proof lights important? 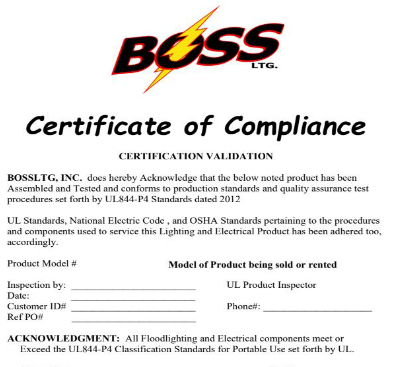 Re-validating your lights with Boss will get the product back to the original OEM safety certification. We’ll fix and repair the lights and get them ready for your next big project. Every company, safety advisor, and project manager on the job-site will have peace of mind through our re-validation program.